Residents in flooded Cumbria have had to endure impassable roads and sealed off homes. Here are two accounts of people's experiences in the county. Now the floods have subsided, and the waters have retreated, they have left their legacy behind for all to see. In the centre of Cockermouth cars are wrecked, shop windows are smashed, and houses are ruined. 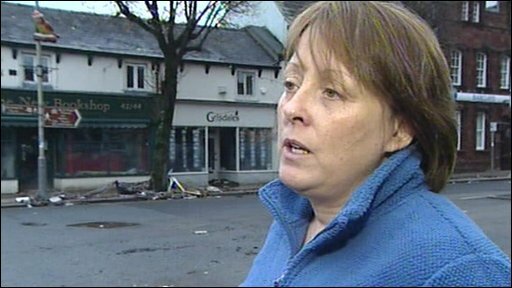 We found Helen Liptrott in her kitchen, clearing thick mud off the floor with a shovel and emptying flood water out of the fridge freezer. It was a heartbreaking sight, but Helen was stoic in the face of adversity, saying: "The emotion hasn't hit yet - it's about being practical. "I'm sure when you realise you haven't got anywhere to live and starting to go back to work it's going to be a completely different set of emotions." Up the road, Jordan Lambert and his family were clearing up too. Their house is in a similar state - mud everywhere, and the furniture up on its end. But for Jordan, who is a student, the loss goes further. He has lost exam certificates and two years' worth of coursework. Not everyone has managed to get back home. The centre of Cockermouth is still out-of-bounds to those who normally live and work here. The police have put cordons around the most dangerous areas. Here the shops and houses are still considered structurally unsafe. Each building has to be assessed before it can be re-entered, and so there are many who would like to get back in, but have to wait. Ken and Margaret Seymour, a retired couple who moved to Cockermouth after years running a guest house in Keswick, are keen to see what has become of their house. They are living in temporary accommodation in the Sheep and Wool Centre - a hotel which has been turned into an emergency shelter. The couple said the way they had been treated was "remarkable" and "fantastic". "We've been really well looked after. If it hadn't been for them, I don't know what it would've bee like," says Ken. But the warmth and hospitality they have been shown in the face of adversity doesn't remove the grim reality of the home they will have to return to. Margaret is still wearing the clothes she was rescued in on Thursday, and Ken is worried about their cars. The Seymours tried to return to their house but were turned away by the police. It's still too dangerous for them to go back, so they headed to the shelter for the night. Ken was frustrated but said: "They're saying it's not safe. That's it - you have to go along with it. "We're both disappointed because we thought we might have been able to see the house. It would have been nice to know what we're going to come back to." As the displaced of Cockermouth hunker down for a fourth night away from home, their community spirit is in good shape and, at the emergency shelter, the tea and coffee are flowing. But it is not like home, and for these people it will be many months before they can move back there again. Local resident Sue Cashmore: "You just think how many more times"
The road that leads to the Calva bridge is closed off. The blue and white police cordon stretches from one side of the road to the other. As well as camera crews and photographers and the helicopters buzzing overhead, a crowd of people in wellies and waterproofs have gathered to get what could be a final look at the bridge. Its collapse is inevitable but engineers say it could happen in hours or weeks - they just don't know. At the roadblock, music teacher Ellen Pearson chats to colleagues who work with her at the Staiburn school and science college. Ellen says she has just been told not to go into school on Monday. "Most of our kids are from Northside and Seaton and they can't get in. I don't know how long this will go on. The bridge closure makes it a really long journey." Will the children have to change schools? "I just don't know", she says. Tony Cashmore, 73, had to be rescued from his house last week. He has insurance, but it won't help. "By law insurers have to offer us cover but because we have been flooded before our excess is £20,000," he says. It means Tony and his wife will have to pay for repair work themselves. His daughter, Sue, says the damage from the last flood cost £17,000, so her father is unlikely to see any insurance money. RSPCA officers are out in force in brightly coloured rescue gear. They are moving from house to house in flood-hit areas checking in on pets that got left behind in the evacuation. For the past two days a flock of geese have been visible on the towns main street, wandering aimlessly. This morning the birds were cornered and caught by a team of brave workers to be reunited with their owner.